A sophisticated ladies' bracelet watch from Barbour. Featuring a smart textured dial with stainless steel hands and indices, this handsome ladies' watch is styled with a stainless steel case and fitted with Swiss quartz movement. 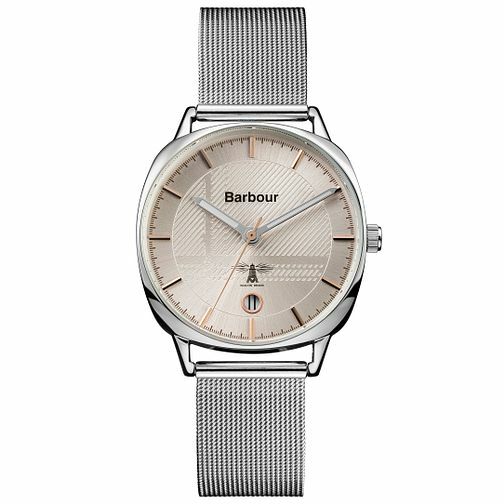 Barbour Ladies' Stainless Steel Bracelet Watch is rated 5.0 out of 5 by 2. Rated 5 out of 5 by Anonymous from Lovely, classy watch Really nice watch, looks more expensive than it is. The rose gold detailing looks great against the face. The strap is nice and the clasp easy to use. All in all a really nice watch. Rated 5 out of 5 by Anonymous from Great service love my watch I absolutely love this watch no links to mess about with as the fasten just moves so can be easily adjusted.